SIA is one of the many airlines that have made it a ruling to carry a third personnel in the cockpit. This is to lessen the chance of pilot suicide as happened on Germanwings Airline in March this year. However, which crew is to be deployed in the cockpit when one of the 2 pilots visits the toilet is an issue which have cause a big headache for the airline. Cabin crew union has refused to let its members be deployed. 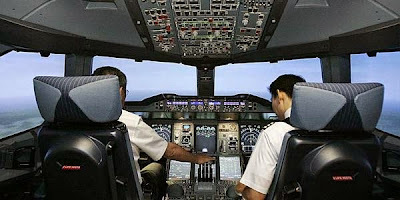 It argued that the cabin crew is put on flights to serve passengers and not to watch over the pilots. Moreover, there is a shortage of cabin crew on all the flights. The pilots' union came in to rescue the situation. It has proposed that SIA recruit the pilots' parents to be the ones to watch over their pilot sons. With just basic emergency training, the parents would fly with their loving sons and also make sure they are not up to any mischief. The pilot's union asked for a token sum of allowances to be paid to the parents. It would not cost more than $2,000 a month. this was what he said, " With their mamas and papas watching over them, I think the boys will think twice before they are up to any mischief ". Now, the SIA management is studying the pilot's union proposal and a decision will be announced soon. Can SIA employ my wife instead of my parents? If this is true, then I'm completely disappointed with the level of problem solving by pilots. 2. Not all children have good relationships with their parents. This can cause more distractions in the cockpit. 3. If this is mandated, would a pilot have to step down if their parent's do not report for flight? 5. How about sectors with 4 technical crew? 7. Cost of hotel rooms. Unless you're asking the pilot to share a room overseas. Latest development. When one pilot leaves the cockpit, the other pilot's hands will be tied to his seat.